"It happened so fast," said the woman, who asked to be identified as Michelle because she feared for her family's safety. "Not even five minutes, not even five minutes. It happened so fast!" The mother had stepped inside the gas station when a man climbed into the driver's seat and tried to drive away, according to police. Michelle said her 2-year-old and 4-year-old children were still in the back seat. "I seen my two babies still back there," Michelle explained. "I'm asking the man, 'hey, my kids are back here. Stop! Pull over! Pull over!' He's not even acknowledging anything about my kids." 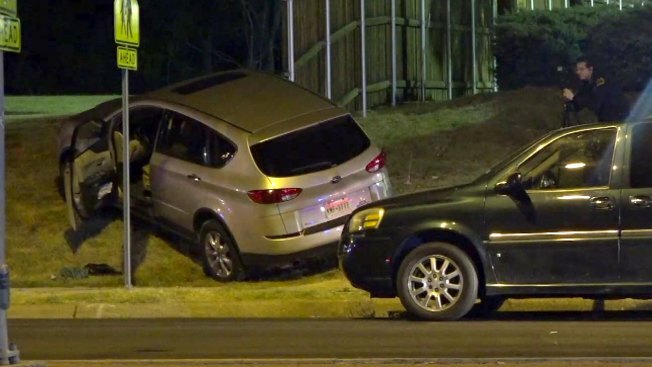 "When I see that he's not trying to stop, he kept hitting the gas, I went toward my glove compartment and grabbed my gun and I fired at him from the side," she said. "Just to see him slumped over like I was just like, Lord, my kids [are] in the car. They done seen me shoot somebody," she recalled. Michelle was not facing charges, according to police. NBC 5's Maria Guerrero contributed to this report.